The 2014 Annual Congress of the University and College Union Scotland Congress (UCU Scotland) today voted unanimously to condemn the planned visit by Israeli war criminal Tzipi Livni. The Israeli politician was given a rare diplomatic passport by the UK Government in 2011 specifically to protect her from the risk of arrest and prosecution for complicity in Israeli war crimes. 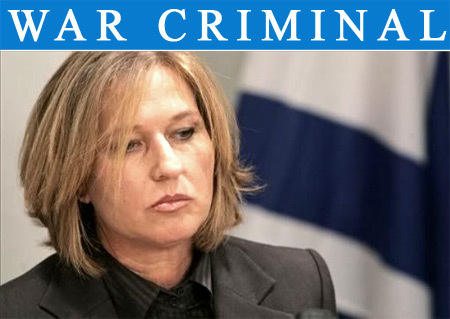 Livni is planning to speak at a provocative Nakba Day meeting of the racist JNF (Jewish National Fund) at a secret central London venue on Thursday 15th May. UCU Scotland Congress called on Theresa May to refuse Livni entry to the UK. On Nakba (“Catastrophe”) Day, Palestinians remember the wave of Zionist ethnic cleansing that engulfed Palestine in 1948, and created the world’s largest refugee population. Every year on 15th May Palestinians and human rights supporters protest Israel’s ongoing ethnic cleansing programmes, house demolitions and Israel’s apartheid system, of which the JNF is a central pillar. Stop the JNF UK supports the demonstration called by Palestine Solidarity Campaign of England and Wales and the London Palestine Action in Central London on Thursday May 15th to protest the racist JNF and its war criminal guest, Livni. In late 2009 Livni cancelled a scheduled visit to London when she discovered an arrest warrant had been issued against her on the grounds she had been a member of the Israeli war cabinet which organised the massacre of more than a 1400 Palestinians. Click here to write to Home Secretary Theresa May to demand that Tzipi Livni be prevented from entering the UK to participate in incitement to hatred and division.